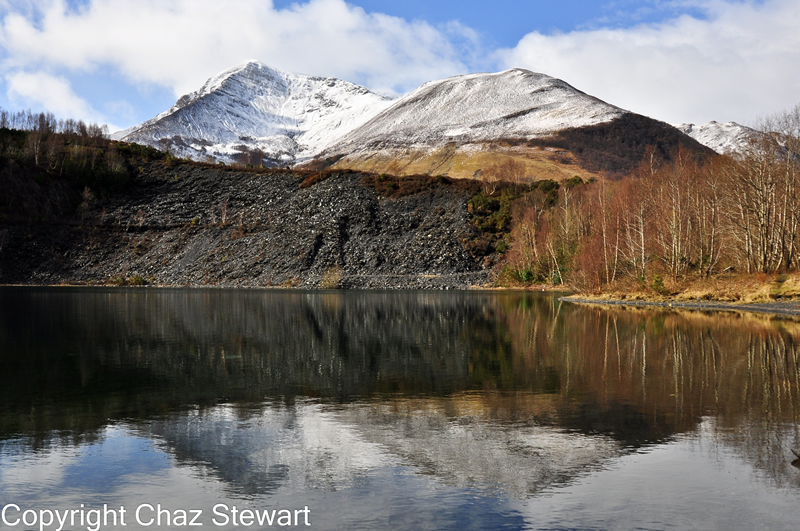 Between 1902 and 1905 the Ballachulish community was badly affected by two protracted conflicts in the slate quarries. The first began in July 1902, involved a twelve months lockout, and lasted eighteen months. The workers objected to the summary dismissal of the medical officer Dr. Lachlan Grant from both his work in the quarries and his post as Medical Officer for the Parish Council District of Ballachulish. They also objected to the unsatisfactory labour contracts, inadequate wages and excessive charges for the powder, coals and other materials supplied by the company. The second dispute started in the summer of 1905 when members of a hostile crowd charged the quarry manager with autocratic, dictatorial and unfair behaviour towards both Dr. Grant and members of the quarrying labour force and the community. A new company was formed in 1907, allowing work to resume without further interruptions. At times when the quarry was operating at full capacity, it is recorded to have produced over 26 million slates per annum in the early 20th Century. This was achieved with a workforce of between 3 and 4 hundred. There was a lengthy speech regarding the dispute at the Quarries in Ballachulish, and the fact that the root cause was a probable violation of the Truck Act. The details of the dispute (as outlined above) are given in quite some detail. The Secretary of State for the Home Department stated that he was not previously aware of the dispute, but he would waste no time in looking into the matter and seeing what, if any, action was to be taken. The Callendar & Oban Railway opens the Ballachulish branch to Ballachulish. The terminus was at Ballachulish primarily due to the substantial volume of freight that was anticipated from the Slate Quarries, and also because there was no easy route to extend it eastwards to the new Aluminium Smelter being constructed at Kinlochleven, but Ballachulish minimised the shipping distance by water. The line was intended to be the first part of a route which would eventually link up with the West Highland Railway at Fort William and then through the Great Glen to Inverness. However, arguing between the various railway companies involved, and subsequent debates in the Houses of Parliament resulted in deadlock, and the route was never finished. The official opening of the line was on 21st August, with reports of trains running the previous day. However, full opening of the line for traffic had to wait until the 24th August. The station was initially named just Ballachulish, with the halt above the ferry at South Ballachulish called Ballachulish Ferry. 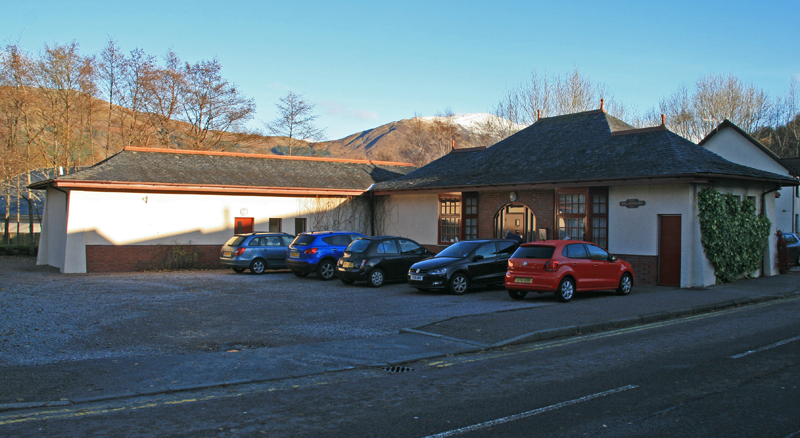 Later changes saw Glencoe and then Kinlochleven incorporated into the name of the village station, but the fact that the station was called plain Ballachulish rather than Laroch or Ballachulish Quarries marks the final phase of the name change for the village. The original timetable lists 5 trains each way each day. On the same day as the railway opened, the new railway pier at Kentallen was opened. This started the slow transfer of steamer and puffer boats from the older pier at Ballachulish. Kentallen had the advantage that the ships did not need to turn in towards Loch Leven to stop, so saving time. In 1905, the first motor bus service in the area was started. It was run by the North British Railway, presumably in lieu of the railway line they had permission to build between Fort William and North Ballachulish. However, the service was given up in June 1906. The Bus service resumed in December 1906, as the first of many motor bus services operated by MacBraynes. Initially a rather unreliable Daimler was used, but it was soon replaced by a newer vehicle. This was a Scottish built, chain-drive 14-seat Albion. Once across the narrows the passengers then had a short walk to the new ferry station to continue their journey. There was at times a horse drawn cart available to transfer people between ferry and station, although this service does not appear to have been always available. The first car is carried on a regular ferry across the Ballachulish Narrows. Cars were driven onto planks resting across the width of the boat which was then rowed across the loch by two men, according to photos. The ferry at the time was operated by the nearby Ballachulish Hotel. This is 4 years after the arrival of the first car in the area, which was reportedly driven through Glen Coe in 1902. Presumably it did not continue to Fort William, unless special arrangements were made, or one of the other ferry crossings used. The Post Master General was asked about a recent change to postal addresses in Ballachulish, where the modern village had been changed to Ballachulish Quarries, leaving the Ballachulish name for South Ballachulish. He replied that no such change had been made in the last 20 years, following a brief change that proved to be unpopular, and that any change was objected to by the residents. Within the question it is revealed that there are 240 householders in Ballachulish village and 10 householders in South Ballachulish. The first Turntable Vehicle Ferry is in service, carrying one car at a time. The boat, named Glencoe, was built at Clynder on the Gareloch on the Firth of Clyde, and is believed to have been the first ever turntable ferry. Whilst the turntable could be easily turned by hand, such was the balancing of it, the additional weight meant that the new ferry was motorised. Unlike later ferries, the turntable was not primarily designed to allow cars to drive on and drive off, but to allow cars to be loaded across the boat, and then turned to sit along the length of the ferry, making the crossing more stable. It seems probable that it operated alongside a traditional rowing boat for pedestrians to use. The precise date of introduction seems to be disputed, with a range of dates offered by different sources. This may be because a second one was acquired soon after the first, suggesting that it was a success. However, no record of this second ferry’s name or demise has appeared, and it was the Glencoe that stayed in service when a new ferry was added in 1926, so perhaps there never was a sister vessel. Many men from the Ballachulish area fought in the First World War, and sadly there are 37 names recorded on the Ballachulish & Glencoe War Memorial near St Johns Church. A further 9 names are recorded on the Nether Lochaber memorial. The Secretary for Scotland was asked about a dispute at Ballachulish Quarries which had caused the owners to close the quarries, and the resulting reduction in production of Slates for building. He replied that there had been no dispute, that the quarries had closed 3 years earlier, flooded and that the equipment had been sold, meaning that no restart was planned. The road from Glencoe to Kinlochleven along the south side of Loch Leven, now known locally as the High Road was largely completed and open to traffic. Much of the work was done by Prisoners of War from the camps at Kinlochleven. Kinlochleven Viaduct and Invercoe Bridge were added later, the former in 1927 and while the latter is undated, it is believed to be of the same date. The Low Road along the north shore of the loch was no more than a rough track although it was open to vehicular traffic, as a member of the Inverness Masons was killed in a car accident near Callert as early as 19/7/1916. Undoubtedly the poor condition of this track played a part in the accident. The car was with others when it overturned after consecrating the new lodge in Kinlochleven, which suggests that the route was passable. Following the end of World War 1, and subsequent to a Royal Commission into Housing initiated in 1912, there was a ‘Homes fit for Heroes’ campaign and the Housing Act (1919) which led to the construction of hundreds of thousands of local authority housing across the UK in the next half century. 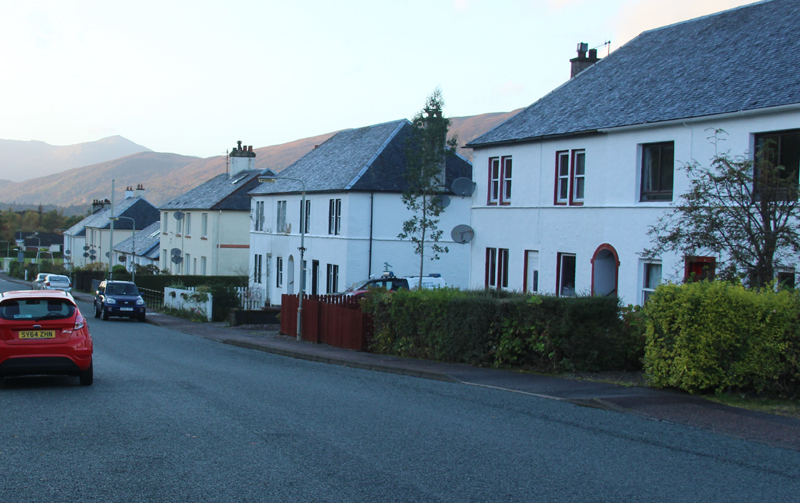 The first new houses to be built in Ballachulish were Lorne Buildings and Leven Terrace and by 1939 the block of Albert Road and Park Road had been started. Unfortunately, due to the outbreak of war, work proceeded slowly, and it was the mid-1950s before many of these houses were completed. The Crescent in West Laroch and Argyll Cottages also date from this time, as do Baile Ur in North Ballachulish and the row of houses in Glenachulish. The Parliamentary Secretary to the ministry of Munityions and the Minister of Health were asked about leases on the Slate Quarries at Ballachulish, which were lying dormant despite containing ‘large supplies of best quality slate’. The reply was that no lease had been agreed, but the matter was being considered, if a satisfactory contractor could be appointed.